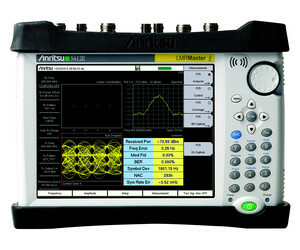 The Anritsu S412E LMR Master combines a high-performance spectrum analyser, vector network analyser (VNA) and signal generator with internally adjustable power. The instrument is suitable for land mobile radio (LMR) technicians and engineers engaged in field testing the RF performance of NBFM, P25, DMR (MotoTRBO), TETRA, NXDN, dPMR and LTE for commercial, public safety, maritime and critical infrastructure radio systems. Anritsu has announced the introduction of TETRA OTA BER measurement for the LMR Master. Traditionally, radiofrequency coverage measurements have been made by only measuring the power level of the signal of interest. A radio system was deemed to have sufficient coverage if the signal level of the transmitter was above a predetermined threshold. However, just because you measure high signal levels does not mean that the radio system is working as intended. High signal levels could be caused by interference. A better metric to measure is BER, which is calculated by comparing a transmitted sequence of known bits to the received bits and counting the number of errors. The ratio of how many bits received in error over the number of total bits received is the BER. This measured ratio is a good indication of signal quality. This is why over-the-air (OTA) BER measurements are highly desirable when making coverage measurements. The main drawback to making OTA BER measurements is the requirement to transmit and receive a known bit sequence. In the past, this required that a TETRA site must be taken out of service. Many TETRA sites cannot be taken out of service even for short periods of time. The latest TETRA OTA BER measurement from Anritsu uses a proprietary method to estimate BER from a live TETRA base station’s data stream without the requirement to take the TETRA site out of service. 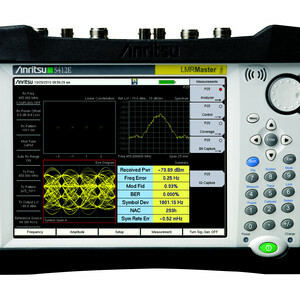 I am interested in Anritsu LMR Master with TETRA Over-the-Air BER Measurement .